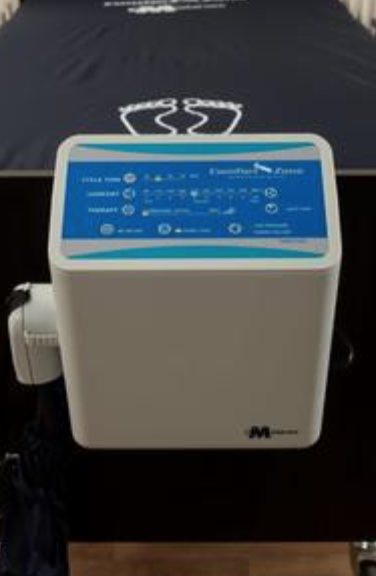 This state of the art Adjustable Cycle Alternating Pressure Mattress heals up to stage 4 bedsores using a digital pump which is micro processor controlled. The adjustable air mattress uses alternating pressure technology with low air loss that reacts to a patients movement. This micro processor controlled medical air mattress is hospital grade and automatically readjusts air flow for optimal performance and comfort. The adjustable cycle mattress uses dual therapies to prevent and heal bedsores. Alternating pressure reduces painful pressure points allowing blood flow to reach all areas of the body. The low air loss provides air circulation to prevent heat and moisture build up as it protects the skin. 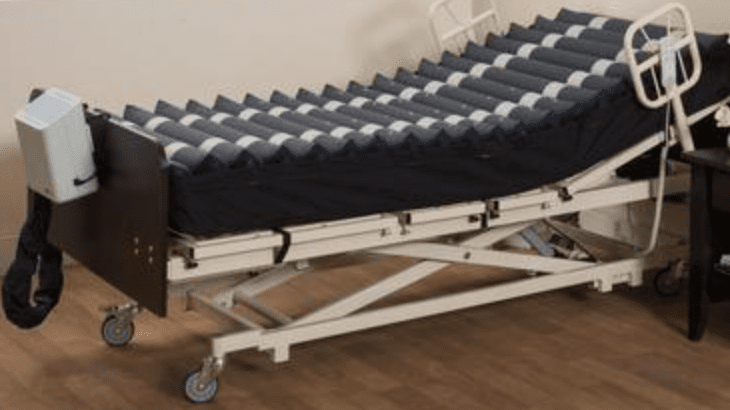 This adjustable alternating mattress fits easily over any hospital bed. 36" X 80" X 8"
This state of the art adjustable medical air mattress system has 4 cycle times. (10,15,20,25 minute cycles) Most alternating pressure mattress systems are only set at one predetermined cycle. This adjustable air mattress allows the patient to control and change the alternating cycle times giving more flexibility and comfort to the mattress. Adjustable alternating cycles are commonly used for pain management. 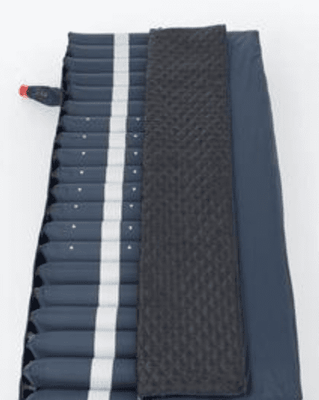 They can be used to redirect pressure or to increase blood flow and offer more options for pressure relief than most standard air mattresses. Adjustable cycle pressure relief therapy can be used for the patient in pain that does not want to be moved much. The slow intervals softly redirects pressure under the patient without disturbing them when they sleep. Adjustable cycle time functions control painful pressure points while still allowing blood flow to reach the skin to heal and prevent bed sores. The pump has static float option. Pushing the static button the pump rapidly hyper-inflates the air cells or baffles so they perform like rollers. This creates a stable support surface making it easier to turn and position patients. The static float may require less force than traditional draw sheets and pillows. This feature may decrease the nursing time required for turning and repositioning patients. It can reduce risk of injury to caregivers' backs, shoulders and wrists. It is often used to assist the patient as they transfer in and out of bed. Static pressure also is commonly used for patients that prefer to sit on the edge of the bed safely. The mattress has a built in cell on cell design. This will prevent sagging in the center of the mattress. It offers additional support when elevated and prevents the mattress from bottoming out in the event of a power failure. Bottoming out can often lead to an increase in pressure and can stop blood flow to the skin. The cell in cell design adds a protective air barrier between the patient and the bed frame. The soft 4 way stretch cover is high quality designed to prevent sheering on the skin. The 4 way zipper makes it easy to remove and clean. It is fluid proof to protect the mattress and provides comfort for the patient. Ideal for home care use, nursing home mattress, hospice or rehabilitation centers. Get Free Shipping on Our Adjustable Cycle Alternating Pressure Mattress System Now! Free fast shipping from multiple warehouses! 10 Level (30 - 60mmhg) or 80 lbs. � 400 lbs. Pump Dimensions 11.4� x 12� x 5.9�.